What was that famous line from Rodney Dangerfield? "I Get No Respect"! Aretha Franklin - Performed a song about it. re·spect - rəˈspekt/ noun - a feeling of deep admiration for someone or something elicited by their abilities, qualities, or achievements. I know people that demand respect. I know people that earn respect. I know people that deserve respect. Wow! The Bible has a lot to say about showing respect. #1 - Show others respect even when they don't deserve it. Don't judge others and determine that you need to withhold your respect. Also, if they are a jerk, be a witness of God's love to others. 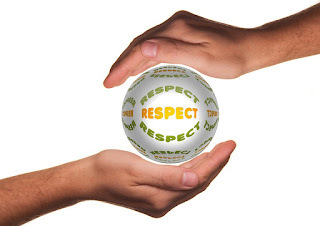 #2 - If you show respect, you will receive respect. The law of sowing and reaping. You will receive what you give. #3 - Show respect with a genuine heart. I have had people show me respect only to learn that their sole desire was to get me to do something for them. That's not respect, that's manipulation.